Much of baseball is about trades. You have to constantly look for talent. You constantly give up talent. On December 22, 1964, Bobby Del Greco was purchased from the Braves by the Philadelphia Phillies. He played for one more year. Del Greco grew up in Pittsburgh’s Hill District and was signed by the hometown Pirates. They traded him to the Cardinals on May 17, 1956 in a deal that brought center fielder Bill Virdon to Pittsburgh. He helped the Yankees win the 1957 American League pennant. Del Greco was a speedy, defensively sound player. The Yankees acquired him to fill in for Mickey Mantle in the late innings. 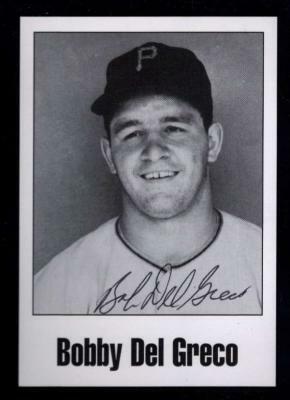 Del Greco played his last major-league game for the Phillies in May 1965 and remained in the minor leagues through 1967. In nine seasons he played in 731 Games and had 1,982 At Bats, 271 Runs, 454 Hits, 95 Doubles, 11 Triples, 42 Home Runs, 169 RBI, 16 Stolen Bases, 271 Walks, .229 Batting Average, .330 On-base percentage, .352 Slugging Percentage, 697 Total Bases and 29 Sacrifice Hits. He wore 10 different numbers in his 9-year career. The 1965 Milwaukee Braves season was the 13th and final season for the franchise in Milwaukee before moving to Atlanta for the following season along with the 95th season overall. The Braves finished the season with a record of 86–76, 11 games behind the eventual World Series champion Los Angeles Dodgers.